Daniil Trifonov: "The Pianist For The Rest Of Our Lives"
In the galaxy of talented pianists under 30, Daniil Trifonov shines exceptionally brightly . . . [he] is an intense musician. From the moment he steps on stage, it is as if something is aflame inside him, which then flares into being at the piano. In his hands, familiar works seem entirely newly minted, yet make perfect sense. Trifonov never plays a repeated phrase the same way twice, and his flair for drama and narrative reaches heady heights in combination with his beauty of tone and inextinguishable passion for the music.
. . . [Daniil Trifonov,] very much the young pianist of the moment, . . . gave this debut recital on the main stage of New York's Carnegie Hall . . . The playing testifies to a maturity of technique and vision remarkable in a musician who was only 21 at the time. No less an authority than Martha Argerich has said that "he has everything and more. What he does with his hands is technically incredible", adding that "his touch has tenderness and also the demonic element". That combination of qualities comes through with particular clarity and thrill here in Scriabin's Second Sonata (Sonata-Fantasy) and Liszt's Sonata in B minor. It is not merely the power and dexterity of Trifonov's playing that make such an arresting impression, though the torrents of octaves in both the right hand and the left towards the end of the Liszt are astonishing in their brilliance, boldness and bravura. Rather, the key thing here is that Trifonov can harness his digital strength, stamina and skill to a highly developed sense of the music's expressive substance. In the opening Andante of the Scriabin, for example, you can hear (and see, if you follow the score) that Trifonov has absorbed the significance of nuances and graduations of dynamics and pacing to find the very nub of Scriabin's distinctive world of sound. Argerich is right about the tenderness Trifonov can voice through his pianism, nowhere more than in his beautifully poised, interpretatively thoughtful and lucidly textured Chopin Préludes Op 28. An encore of a Medtner "Fairy Tale" caps a captivating recital brimful of character.
. . . a clear demonstration of what this pianist does well, in works well-suited to his talents. Trifonov has a reputation for his dazzling technique, which he has shown to best advantage in performances of Romantic repertoire, and his live readings . . . offer a well-rounded impression of his extraordinary abilities. The Scriabin opener gives Trifonov an opportunity to display his amazingly quick prestidigitation in the second movement, and several of Chopin's preludes are whipped off with a velocity that impresses . . . But Trifonov has a much greater depth than his fireworks suggest, and his Scriabin and Chopin have moments of lucid reflection that reveal Trifonov's thoughtful, expressive side. Yet he seems most at home in Liszt's monumental sonata, with its brooding passages, wistful reveries, and dynamic surges that reveal the volatile and poetic temperaments to which he feels most attuned. Trifonov is decidedly a virtuoso in the Lisztian mold, so it would behoove him to make his next recital album an all-Liszt program, though this exceptional performance of the Sonata in B minor will have to satisfy his fans until then. This release, recorded live, includes one of the finer interpretations of the Chopin Preludes, Op. 28 . . . Trifonov draws on reserves of technical finesse to create palettes of color and nuance for each prelude; his breathtaking "leggierissimo" (No. 19), supple "rubato" (No. 17), and rhythmic inflection (No. 12) are particularly effective. Another highlight is Liszt's Sonata in B Minor. Played in the style of a tone poem, the sonata evokes a sense of mystery from the opening "Lento assai" throughout the work's darkly introspective moods and dramatic climaxes. He also brings a spontaneity and freshness to Scriabin's second sonata, Op. 19, providing a seamless continuity to episodic melodies and textures. Medtner's "Fairy Tale in E-flat, Op. 26, No. 2", offers a piquant ending to this essential disc. Another super-virtuoso whiz kid? Well, there's no denying either his virtuosity or his endurance. Not many pianists would include "both" the Liszt Sonata and the full run of Chopin Preludes on the same program, much less one opening with the Scriabin Second -- and the technique is nearly flawless from first to last. But there's nothing callow in the playing. Fresh, spontaneous, even youthful -- yes; but it would be hard to find evidence of immaturity. What strikes me most about this recital is its expressive range. From the opening measures of the Scriabin, with their prismatic teasing of dynamics and rhythm, you know that you're in the hands of someone who refuses to announce a clear interpretive itinerary at the start. Rather, he gives us superbly eventful playing, full of twists and turns, always ready to cast an unexpected light on a detail, to give some new balance to the contrapuntal lines, or to provide an unexpected dash of colour . . . Trifonov is a subtle artist, and he's more interested in gentle surprises than in whiplash shocks. But his readings certainly are highly personal. Certainly, his Liszt is liable to throw you off balance. For the opening three and a half minutes, up through the first statement of the Grandioso theme, he seems to promise us an angular, biting, Modernist interpretive spin . . . Yet it doesn't work out that way: In the end, this performance is notable as much for its gentle inwardness as for its rancor, as much for its generous splashes of pre-Impressionist color as for its moments of granitic solidity, as much for its delicacy of utterance (try the breathtakingly peaceful ending) as for its volcanic eruptions . . . I found the improvisatory spirit captivating from first to last -- and I found the Chopin even better. On the whole, despite moments that will knock you out, it's a slightly soft-spoken account. Highlights? I could, I suppose, single out the supple, surprisingly old-fashioned charm of the First Prelude, the unbuttoned lift of the Third, the terrifyingly controlled fury of the 12th, the velvet tone on No. 13 (especially on the B section). But the fact is that what we get here is a rare performance "without" highlights, one in which every prelude is given a chance to speak in its own voice. The Scriabin is just as remarkable, boasting a luminous fluidity that takes your breath away . . . Fine sound, too. Urgently recommended.
. . . a scorching 2013 performance of Scriabin, Liszt and Chopin. A triumph of will and technical audacity, Daniil Trifonov's Carnegie Hall recital explores the Romantic ethos brilliantly . . . [Scriabin 2]: Trifonov demonstrates a vast color palette in the course of this compressed tone-poem, not to mention the blistering speed at which he can consume rapid notes within the bar while executing huge spans, tenths and twelfths, with no loss of articulation. Something of sinister bat's wings unfold in the exposition of the 1854 Liszt B Minor Sonata, especially in its tortured trills and plummeting octaves . . . The breathed spaces between the notes, the exalted sustained line, support anyone's claim that Trifonov belongs to the distinct circle of inspired Liszt interpreters that include Horowitz, Cziffra, Kentner, Arrau, and Bolet . . . [Chopin]: Even the abbreviated D Major Prelude can shine and flame out, a moment of subjective epiphany . . . With a startling gusto, Trifonov concludes with a brilliant "Fairy-Tale Etude" by Medtner, all syncopes and willful asymmetry, dazzling and thrilling to the Carnegie audience as it is to us. He's as assured and fearless a pianist as they come, blessed with 10 of the most agile fingers on the planet. Granted, he tends to sacrifice power for sheer speed, yet his tone is consistently beautiful, abetted by a wide palette of articulations, nuances, and inner voices . . . The Chopin Op. 28 Preludes contain marvelous moments, such as No. 1's rocking lilt; the daring pedal effects that illuminate No. 2's still startling dissonances; No. 5's fanciful cross-rhythmic accentuation; a truly "semplice" and direct No. 7; a fleet and transparent No. 17; No. 8's tenor voice more to the fore than usual (to say nothing of the breathtaking tempo and control); and an unusually slow yet intriguingly multi-leveled No. 23. Few other performances of No. 22 articulate the undulating push/pull effect between the jabbing left-hand octaves and slurred right-hand chords . . . check out the Medtner Op. 26 No. 2 Fairy Tale encore. Trifonov's breathtakingly supple passagework and repeated notes take wing with little aid from the sustain pedal.
. . . Daniil Trifonov, dieses 22-jährige Genie . . . [war] plötzlich da . . . [und brach] mit einem Paukenschlag in die bass erstaunte Klavierszene ein . . . [Liszt / Sonate h-Moll]: Diese Ausdrucksintensität erreicht derzeit kein anderer Pianist. Man spürt unmittelbar: Da steht ein ganzer Kerl, Mensch, Künstler dahinter. Auch im Finale kann man sich einen vagen Eindruck davon machen, in welchen Dimensionen sich Trifonov musikalisch-philosophisch bewegt. Dieser Pianist spielt weit oberhalb der Konkurrenz. Noch einer, der die Klassikwelt ungestüm erobert! Daniil Trifonov heisst er und wird bereits von Klavierlegende Martha Argerich über den Klee gelobt. Als dieser Pianist im Februar in der New Yorker Carnegie Hall debütierte, stand das Publikum Kopf . . . Die grübelnde Suche nach Wahrheit und Abgrund in Franz Liszts zweiter Sonate ist bestechend. Den 24 Préludes Frédéric Chopins ringt er zauberhafte Romantizismen ab, immer auf der Suche nach noch mehr Ausdruck, noch mehr Schönheit. Als Kontrast leuchtet die gespenstige Leichtigkeit in Scriabins 2. Klaviersonate. Umwerfend.
. . . ein atemberaubendes Debüt . . . [Scriabin]: Schnell wird klar, dass ihm die brachialen Schlachtrosse genauso gut in der Hand liegen, wie zarte Chopin-Préludes. Liszts h-Moll-Sonate donnert er nicht einfach nur nieder, sondern arbeitet trotz aller Kraftanstrengung sensibel die einzelnen Stimmen heraus. Eine Mischung, die schon Klaviergötter wie Martha Argerich ins Staunen versetzt hat: "Was er mit seinen Händen macht, ist einfach unglaublich", schwärmte sie vor geraumer Zeit, so etwas habe sie noch nie gehört. Das einstige Wunderkind . . . ist auf dem besten Weg, einer der ganz Großen zu werden: mit einer atemberaubenden Technik, einem durchdringenden Bass und einer überaus feinsinnigen Interpretation. Trifonov entfacht . . . ein Feuerwerk auf der Bühne, lässt sich berauschen von der Macht der Musik und ergibt sich bedingungslos seinem eigenen interpretatorischen Kosmos. Den mit seinem Publikum zu teilen, scheint Trifonovs oberstes Gebot, wenn er sich mit ganzem Körpereinsatz in die Musik versenkt. Das Publikum folgt ihm wie in Trance, weil es seinen unbedingten Willen, Musik zu machen, spürt; weil es angesichts seiner virtuos-artistischen Technik gar nicht anders kann als sich seinem Sog zu ergeben; weil seine Rubati, seine dynamischen Schockwellen und Spannungsbögen wenn auch teilweise ungewöhnlich, so doch unausweichlich scheinen. Liszts h-Moll-Sonate -- ein unberechenbarer pianistischer Tsunami. Doch neben dämonischem Furor weiß Trifonov im nächsten Moment auch in weltvergessene Apathie zu verfallen, wenn er am Rande zur Unhörbarkeit durch manche von Chopins Préludes op. 28 traumwandelt. Mit 22 Jahren kultiviert Daniil Trifonov am Klavier eine Freiheit, die nicht für jeden Künstler erstrebenswert erscheinen dürfte und für die meisten Pianisten wohl ein Leben lang unerreichbar bleiben wird.
. . . der 22-jährige russische Virtuose überwältigt förmlich: eine Klasse für sich . . . vor allem seine Livekonzerte beinhalten, was ihn außergewöhnlich macht . . . der erste Satz aus Alexander Scriabins Sonaten-Fantasie op. 19 verlangt sensible Finger, Geschmack und Anschlagskontrolle, was Trifonov souverän wie ein alter Hase absolviert. Danach geht dann die Post ab. Im Presto-Satz benötigt Trifonov genau 3:26 Minuten, um zeigen, dass er seine Grenzen technischer Art noch suchen muss. Daniil Trifonov findet sie auch keineswegs in der gefürchteten h-moll-Sonate von Franz Liszt, die er nach dem verhaltenen Intro mit geradezu anmaßend forschem Tempo beginnt. Das knackige Fugenthema analysiert er mit der klaren Kraft eines Glenn Gould, wie er sich auch mit sicherer Hand dazu entscheidet, den hier angelegten Swing markant herauszuschälen. Und Trifonov weiß genau, was er noch vor sich hat, denn dieses gnadenlose Tempo hält er bis zu den wahnwitzigen Wasserfall-Oktaven des Finales durch, die manch ein übermütiger Kollege auch mal unscharf verrauschen lässt. Nichts davon bei Trifonov. Es blitzt jedes Detail, bis Liszts Reifeprüfung für Pianisten nicht als bestanden, sondern als beherrscht abgehakt werden kann. Es gab Anfang der sechziger Jahre eine legendäre Live-Aufnahme der Sonate von Emil Gilels, die in etwa diese Klasse reflektiert, die nicht einmal Vladimir Horowitz toppen konnte. So spielt Trifonov auf Anhieb in der Champions League der Pianisten. Die 24 Chopin-Préludes op. 28 lässt Trifonov darauf als Zauberland des Klanges kontrastieren, in dem Technik Voraussetzung, aber stets nur Mittel zum Zweck ist. Wer einen vitalen Eindruck seiner Lesart dieses Zyklusses gewinnen will, mag mit der allzu bekannten Nummer 15 beginnen. Technisch leicht und für jeden halbwegs begabten Klavierschüler zu bewältigen, interpretatorisch und anschlagstechnisch ein Mount Everest. Zumindest, wenn man Trifonovs unendlich differenzierte und tief ausgelotete Version als Maßstab nimmt. Wohin mag dieser frühreife Tastenphilosoph wohl in zehn Jahren gelangt sein? Trifonov hatte die New Yorker mit einem Mammutprogramm hingerissen . . . [Trifonov ist] ein Klavier-Phänomen, nicht nur wegen seiner überragenden Technik. Es ist sein Geheimnis, wie er, der keineswegs zu Extravaganzen neigt, jedes Stück so frisch klingen lassen kann, dass man glaubt, es eben erst zu entdecken. So etwa die Fuge in der Liszt-Sonate, die Trifonov rhythmisch so pointiert spielt, dass sie fast lustig klingt, ehe sie dann ins Dramatische umschlägt. Das fis-Moll-Prélude von Chopin klingt in seiner rauschartigen Virtuosität ungreifbar leicht und gleichzeitig doch drängend sehnsuchtsvoll. Große Kunst, die sich nicht restlos erklären lässt.
. . . [Scriabin]: Trifonov interpretiert hier nicht nur, sondern lässt die Musik durch sich hindurch fließen und wirken. Alle Dimensionen von Tempo, Harmonie, Klang, Rhythmus und Harmonie scheint er unabhängig voneinander zu beherrschen und daraus eine höhere Einheit zu schaffen. Auch bei der monumentalen h-Moll-Sonate von Liszt breitet Trifonov ein ganzes Panorama an Klanglichkeiten und Seelenzuständen aus, ohne je den Zusammenhang zu verlieren. Im Gegenteil: er führt mit traumwandlerischer Sicherheit durch die zerklüftetsten Akkordschluchten. Seine Chopin-Preludes sind in jeder Einzelheit ausgefeilt und wirken dennoch wie spontane Einfälle und Launen. Viele junge Pianisten bringen die technische Brillanz mit, diese anspruchsvollen Stücke spielend zu bewältigen. Aber Daniil Trifonov geht in seiner Gestaltungskraft weit darüber hinaus. Statt über Tasten und Hämmer scheint er die Klaviersaiten direkt mit seinen Nerven in Schwingung zu bringen.
. . . ["The Carnegie Hall Recital" zeigt, dass er] keine fingertechnischen Schwierigkeiten zu kennen scheint. Atemraubend perlt sein Spiel, das er noch in den physiologisch anspruchsvollsten Partien problemlos modulieren zu können scheint . . . Statt mit Fingerfertigkeit zu beeindrucken, die ihm selbstverständlich scheint, verblüfft der Nachwuchsstar mit Klangvaleurs und Texturen, die man so noch kaum je gehört zu haben meint . . . [man versteht Martha Argerich]: Da scheint tatsächlich das Klavierspiel der Zukunft aufzublitzen.
. . . ein fabelhaftes Debüt-Album . . . ein staunenswerter Live-Mitschnitt . . . eine der erstaunlichsten Platten des jungen 21. Jahrhunderts . . . Trifonov ist ein Phänomen. Wie er auf der CD den Beginn von Alexander Skrjabins 2. Klaviersonate ganz im Einklang mit dem Untertitel als "Fantasie-Sonate" begreift -- wie er also die Elastizität der Form und die Freiheit des Schöpferischen verbindet --, das ist beeindruckend . . . [Trifonov] spielt das hinreißend, wie ein Artist, der das Zeug zum Mystiker hat. Liszts h-moll-Sonate ist danach ein Ereignis, wahrhaft ein Ereignis. Trifonov bekommt den Saal still, er zwingt ihn zur Demut, denn er lässt sich Zeit, ohne Nachdenklichkeit zu inszenieren. Er begreift das Werk als konstruktive Poesie, er zerrt nicht an der Materie, sondern verflüssigt die Strukturen. Noch selten hat man das Werk so leicht erzählt gehört, ohne dass es an Tiefgang verlöre. Er spielt Virtuoses unglaublich sicher, Oktavendonner klingt wie eine mittelleichte Scarlatti-Sonate, es ist ein 800-Meter-Lauf durchs Fegefeuer, aber da ist bald auch Licht auf den Höhen im Pianissimo, dieses Element des Versponnenen, Grüblerischen bei Liszt, das selbst Groß- und Altmeister nur unter Mühen hinbekommen. Am Ende die 24 Préludes von Frédéric Chopin. Der Grad von Trifonovs Reife zeigt sich jetzt darin, dass er 23 Mal sehr schnell und gekonnt an der Stellschraube dreht, 23 Mal einen Beleuchtungswechsel hinzaubert, so dass nicht 24 Stücke erklingen, sondern 24 Gemälde, jedes haargenau in den Rahmen passend, den Chopin vorgesehen hat. Aber Trifonov macht keine Riesenschinken daraus, es bleiben flüchtige Miniaturen mit einem Hauch Ewigkeit . . . Er ist ein Genie und sehr, sehr sicher. Er hat das Profi-Gen, ein Unschlagbarkeits-Abo. Man hört auf der Platte keinen Fehler. Aber das ist nicht der Punkt. Sie ist eine Sensation, weil sie Musik mit Logik und verblüffender Meisterschaft zum Sprechen bringt. Dem mitreissenden Impetus und der staunenswerten Virtuosität des 21-jährigen Musikers kann man sich kaum entziehen. Auch der Mitschnitt von Trifonovs Debüt-Rezital in der Carnegie Hall lässt aufhorchen, zeigt er doch einen Pianisten, der die technischen Hürden der Klavierwerke von Skrjabin, Liszt und Chopin mit geradezu nonchalanter Souveränität meistert, seine technische Brillanz aber stets in den Dienst des musikalischen Ausdrucks stellt. Obwohl er etwa im zweiten Satz der gis-Moll-Sonate von Skrjabin, in manchen Chopin-Préludes und in den schnellen Partien der Liszt-Sonate rekordverdächtige Tempi anschlägt, leuchtet er das musikalische Satzgefüge bis in die letzten Winkel hinein aus; und obwohl er immer wieder zu einem grosszügigen Rubato neigt, versieht er die melodischen Linien mit einer Spannkraft, die mühelos über alle Atempausen und Zäsuren hinwegträgt. Vor allem aber verfügt Trifonov über eine hochdifferenzierte Anschlagskultur, die ihm erlaubt, Klangwirkungen von geradezu orchestraler Farbigkeit zu erzeugen und den Flügel selbst in den vollgriffigen "Grandioso"-Höhepunkten der Liszt-Sonate zum Strahlen zu bringen . . . mit seiner phänomenalen Agilität und seiner gestalterischen Risikofreude und Phantasie reiht sich Trifonov mit diesem Rezital zweifellos in die vorderste Reihe der jungen Pianistengarde ein. Der Pianist Daniil Trifonov zeigt auf seiner Debüt-CD bei der Deutschen Grammophon phänomenale Virtuosität und hohe musikalische Reife . . . Trifonov versteht es, Chopins Préludes als musikalische Charakterskizzen darzubieten. Selbst die etüdenhaft-virtuosen Stücke klingen unter seinen Händen nicht nur brillant, sondern auch poetisch. Das oft verkitschte "Regentropfen-Prélude" besticht durch feine Farbwechsel und fein dosierte Agogik, und im fis-Moll-Prélude entfacht er einen Sturm der Leidenschaft, wie man ihn in diesem Stück kaum zuvor vernommen hat . . . [Liszts h-Moll-Sonate] interpretiert er mit drängender Intensität und zugleich so strukturbewusst, dass man sich an Gilels' berühmte Live-Aufnahme erinnert fühlt. Auch den langsamen Mittelsatz weiß er einfühlsam zum Klingen zu bringen . . .
. . . Trifonow ist phänomenal . . . Bei Trifonow spürt man die Lust, das Publikum zu überwältigen . . . ["The Carnegie Recital" CD: Liszt / Piano Sonata in B minor]: Trifonow begreift das Werk als zarte Poesie; er verflüssigt die Strukturen. Liszts Sonate, die nicht jeder liebt, wird zu einem hymnischen, sich selbst befeuernden Stück. Es ist ein Lauf durchs Fegefeuer, doch am Ende ist, im Pianissimo, auch ein Himmel über den Höhen, und man erlebt dieses rare Element des Versponnenen, Ätherischen bei Liszt, das selbst Groß- und Altmeister nur mit Mühe hinbekommen. Wie vielseitig Trifonow ist, zeigt die CD bei Alexander Skrjabins 2. Klaviersonate gis-Moll. Er nimmt sie im Einklang mit dem Untertitel als Fantasie-Sonate, verbindet die Biegsamkeit der Form mit der Freiheit des Schöpferischen . . . [Trifonov] spielt das wie ein Artist, der ein Herz für Mystik hat. Es folgen die 24 Préludes von Chopin. Fabelhaft, wie er 23 Mal die Beleuchtung wechselt, sodass nicht 24 Stücke eines Zyklus erklingen, sondern 24 Gemälde, jedes in den Rahmen passend, den Chopin vorgesehen hat. Diesmal 24 flüchtige Liebschaften mit einem Hauch Ewigkeit. Das "Regentropfen-Prélude" bleibt ein Klagegesang aus einer mallorquinischen Klause und versagt sich alles öde Donnern im Mittelteil. Darüber spricht er am liebsten ohne Worte. Sein Dolmetscher ist der Steinway. [Eine der] besten Aufnahmen des Jahres 2014 . . . Schon jetzt darf der 23-Jährige zu den wichtigen Pianisten unserer Zeit gezählt werden. Klar profilierte Charaktere bei Chopin und packende Virtuosität in Liszts h-Moll Sonate. Il y a de la magie dans son jeu. Une fluidité qui semble presque toujours couler de source. Une science des équilibres qui frôle ­l'alchimie. Un spectre de nuances infini, au service d'une expressivité jamais superflue, jamais dans la surenchère. On songe à Richter. À Gilels aussi. Non à titre de comparaison. Mais parce qu'il y a déjà, chez cet interprète multilauréat qu'est Daniil Trifonov, l'empreinte du génie. Un matériau encore brut, déjà dégrossi, qui ne demande qu'à s'affiner davantage pour laisser sa marque sur le mur des grandes gloires pianistiques du XXIe siècle. Il suffit d'écouter l'enregistrement de son récital . . . pour réaliser que le jeune homme n'est pas dans l'esbroufe. Intériorité contenue mais jamais convenue chez Scriabine. Virtuosité toujours au service d'un phrasé chez Liszt. Poésie et raffinement chez Chopin, dont il est sans conteste à ce jour l'un des meilleurs ambassadeurs. Si l'on en juge par ses choix de tempi, Trifonov a les moyens techniques suffisants pour en mettre plein la vue . . . Cette intériorité, il en a fait sa marque de fabrique. Des mains quasi immobiles dont les doigts glissent comme par enchantement sur le clavier . . . Il ne joue pas la musique. Il est la musique. 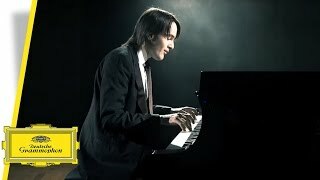 Prodigieux à chaque apparition, Daniil Trifonov anime les partitions de Liszt, Scriabine ou Chopin avec une virtuosité aux frontières du surnaturel . . . une concentration intellectuelle et une force physique stupéfiantes . . . Rien pourtant, dans ce déchaînement soudain de violence, dans cette fulgurance volcanique, ne semble exagéré ou brutal, ostentatoire ou gratuit . . . Secret, ramassé, sans extériorisation calculée ou factice, le Russe garde un contrôle souverain de son jeu et de ses prises de risque, se recroqueville comme il s'était déployé, d'un coup, le nez au ras des touches, le profil caché par un rideau de longues mèches mal taillées. Il y a du Nosferatu dans cet elfe sombre vampirisant son instrument. Ce méphistophélisme . . . convient à la grandiose et diabolique sonate en si mineur de Liszt . . . Frappés au début et à la fin de cette oeuvre d'un seul tenant, des coups répétés et sourds, espacés et secs, semblent ponctuer une mise au tombeau, comme résonner sur le bois d'un cercueil. Mais, sans se complaire dans ce registre funèbre, Daniil Trifonov exalte l'autre versant de l'écriture lisztienne, sa vitalité faustienne, d'allegro energico en prestissimo fuocoso (plein de feu). La sonate en si mineur de Liszt scelle l'union créatrice de l'ancien virtuose des salons romantiques et du prophète de la musique de l'avenir, le triomphe d'un Janus -- Paganini du clavier côté pile, Wagner de l'innovation harmonique côté face. L'interprétation du soliste russe se joue de cette dualité, qui est aussi la sienne. "Il possède à la fois la force démoniaque et la tendresse sensuelle", s'émerveille l'une de ses plus ferventes admiratrices, sa consoeur Martha Argerich. Ajoutant : "Je n'ai jamais rien entendu de pareil." Nous non plus. Dès les premières notes, il se libère de toute forme de tension et nous fait entrer dans un programme audacieux. En effet, associer ces trois monuments de la littérature du piano, trois "planètes" distinctes et massives n'est pas donné à tout le monde. Cet artiste prouve qu'il a évolué rapidement . . . Contrairement à beaucoup de jeunes pianistes qui dévalent avec des sonorités émaciées et dures le finale de la Sonate-Fantaisie de Scriabine, Trifonov offre un piano chaleureux et puissant à la fois. Le son est massif, prenant appui sur des basses, une main gauche d'une fantastique sûreté, fluide et précise à la fois. La Sonate en si mineur impose une dimension épique, mais aussi un contrôle impressionnant du son, des résonnances. On sent qu'elle a été calibrée, millimétrée dans le dosage des moindres nuances et respirations. Ici, pas de fioriture, pas de tempos versatiles, d'outrances, mais un piano coloré qui s'attache à la nuance, à l'équilibre . . . Trifonov ne joue rien qi ne soit pensé, ce qui le rapproche de Zimerman, à la seule différence que le pianiste russe n'a que 22 ans! . . . [Chopin / 24 Préludes]: L'absolu contrôle des voix est fascinant de souplesse et d'intelligence . . . Mais, plus encore, c'est la variété des couleurs, des attaques qui retiennent l'attention . . . [un] récital remarquable . . .